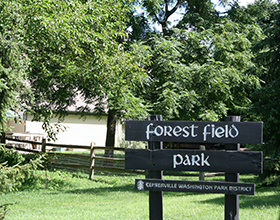 Exciting improvements are in the works for Forest Field Park! Public planning sessions were held in February to receive community feedback on desirable future park amenities. A plan was drafted and shared with the community. With your valued input, we have made some changes to the preliminary plan! The path along the north and south ends has been moved further into the park and outside of the tree line. Some neighbors have asked, “Why the crushed stone path? Can we keep it grass?” The stone path will allow park users of all abilities to get outside and enjoy this great community park. To comply with the Americans with Disability Act (ADA): paths, where not paved, need to be crushed stone. Grass does not meet the requirements. This surface will be accessible for strollers, bikes, wheelchairs and walkers. The nine foot width allows for people to safely and easily pass one another on the trail. We have also shown an improved line of sight between the new playground and the new nature play area. This will be a great picnic area for all residents to watch family and friends at play! Please take a moment to view the master plan (PDF) that resulted from the public planning sessions and community feedback.